BLETCHLEY PARK (IRE) (1989). 2 wins-1 at 2, Kempton Sirenia S., L. Sire of 741 rnrs, 456 wnrs, 29 SW, inc. Modem (WATC Railway S., Gr.1), Hot Jules, Magic Filly, etc. Sire of the dams of 327 rnrs, 153 wnrs, inc. SW Covertly, Jet Set Go, Grand Nirvana, So Secret, London Line, Bedamijo, Manjar, Stage Doll, Secret Link, SP Jet Trail, The Corporation, Cougar Nights, Amazing Grace, Black Magic Miss, Three Nations, Initial Outcome, Siesta Park, Gobiton, etc. Democratism (f. by Bletchley Park). 4 wins. See below. Recount (g. by Cape North). Placed at 3, 2d WATC Westspeed H.
Cruel Mistress (f. by Bletchley Park). Placed in Aust. Kilindini. Winner at 1200m, WATC Perth Racing TV H., 2d WATC Perthracing.com.au H., 3d WATC Hylok H.
Bradbury Lines. 9 wins. See above. PAGO'S KING (Pago Pago). 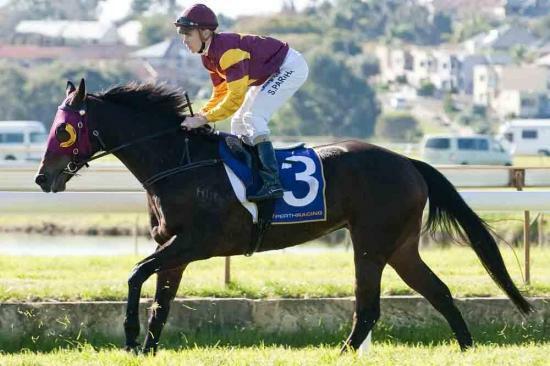 9 wins-1 at 2-from 1000m to 1600m, A$169,650, WATC Prince of Wales S., Gr.3, BATC Doomben Classic, L, WATC Budget Rent-A-Car H., Bates Saddlery H., Easter P., Maniana Quality S., Festivity Sprint H., Howard Sattler H., Coronate H., 2d WATC Challenge S., L, Kings Park Welter H., Penfolds Wine Group H., Australian Orchid Society Sprint H., 3d WATC Roma Cup, Gr.3, Key Dancer Welter H., Toyota Tarago Welter H., Beat Diabetes 2 Welter H.
The Fountain. 3 wins to 1200m in Aust. Heed the Warning. Winner at 1400m, 3d WATC Water Power H.
ELATION, by Showdown. Winner at 1000m in Aust. Dam of 1 foal. 4 wins at 1100m, 1200m, A$188,706, WATC Pink's Biodegradable Remote Solution H., Westspeed 3YO H., Liquor Barons H., 2d WATC Reed Resources H., Westralian Diamond Drillers H., Community Public Sector Union WA H., 3d WATC Westspeed 3YO H., Racing Radio 1206AM H., Irish Day Luncheon H.
2014 c. by Frost Giant. 2015 f. by Planet Five. Served by Safeguard. Date of last service, 20.11.2015.